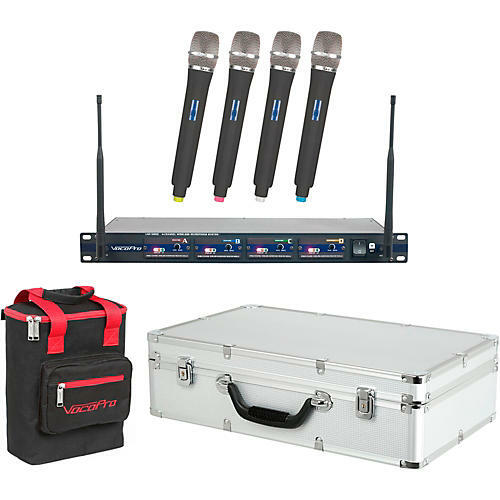 Experience ultimate freedom with the UHF-5800, VocoPro's first 4-channel UHF wireless mic system. With 4 handheld mics, each on their own independent UHF channel, the UHF-5800 gives you maximized vocal options without the fear of frequency interference. Going wireless means that you are free from cables for more active performances that the crowd will never forget. Plus, a 12-hour Mic battery life means the party can go all night. KJs will love that each mic channel has its own field-replaceable module that easily slides out, without the need for tools and without affecting the functionality of the other channels. Vocalists, home entertainment enthusiasts, and club-goers will all benefit from the reliability and versatility of the UHF-5800.